Guitar amps are specifically designed to amplify electric guitars, but you can also use them to amplify vocals. If you're a vocalist or MC on a tight budget or don't have access to a PA system, running vocals through a guitar amp may be your only feasible option. Keep in mind that guitar amps are designed to amplify the mid-range frequencies of an electric guitar and not the fuller range of the human voice. Vocals often sound harsh and lack definition when amplified using a guitar amp. Turn the guitar amp's volume and gain knobs to zero. Turn off any distortion by using the amp's clean channel or setting distortion knobs to zero. Plug the XLR end of a microphone cable into your microphone. The XLR connector is circular and has three pin holes. Plug the TRS 1/4-inch connector into your guitar amp's input. Connect it to the same input you use when plugging in an electric guitar. Increase the amp's volume using the volume knob. Turn up the volume slowly and talk or sing into the microphone as you test the vocal level. Improve the sound quality of your vocals by adjusting the amp's bass, mid and high frequency knobs. Experiment with EQ and volume to find a setting that suits your particular amp model and microphone. Test out the microphone volume and EQ while playing with your band to ensure the vocals are audible. Wear ear plugs when testing EQ and volume settings. The amplifier may feedback when the volume or a particular frequency is turned up too loud. 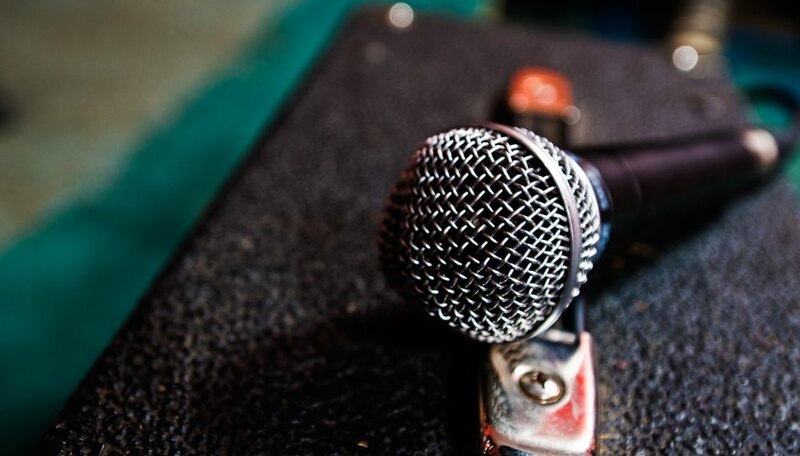 Aim the microphone away from the amp's speaker to avoid feedback. Reduce the chance of feedback by not placing the microphone too close to the amplifier. Miles Jarvis has been writing since 2009, with expertise in the field of East Asian languages and culture. He earned a B.A. in Chinese studies at the University of Waikato and has also studied at universities in Hong Kong and Japan.